Glenn Irwin is considered a leading contender in the Superbike class on the PBM Be Wiser Ducati at the North West 200 . Glenn Irwin is all too aware of the weight of expectation surrounding his Vauxhall International North West 200 return this week as he prepares to make his debut at the event on the PBM Ducati. 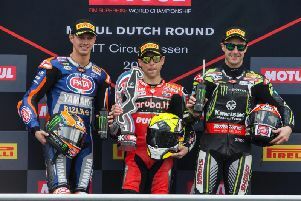 The British Superbike rider has been in red-hot form on the Panigale R this season, beginning the year with a brilliant podium in race two at Donington Park and claiming the best result of his career to date with a superb runner-up finish behind team-mate Shane Byrne at Oulton Park last Monday. The 27-year-old was nothing short of sensational on his debut at the North West 200 in 2015 when he finished on the rostrum in the Supersport class. Irwin sat out the seaside meeting last year, but he did compete at the Macau Grand Prix on the Ducati in November, where he was in the running for the podium places on his race debut before technical issue thwarted his chances with around a lap to go. He will concentrate solely on the Superbike class at the North West and admits he cannot wait to unleash the Italian thoroughbred on the 8.9-mile Triangle course in opening practice tomorrow, although he says he will approach the event with a dose of realism. “It’s cool to be going back to the North West 200 after a year off, I can’t wait to ride my Be Wiser PBM Ducati in front of so many local fans on such an iconic track,” he said. “There seems to be a lot of expectation from fans which is great but this is only my second year for me, and my first ever time there on a Superbike. It’s important to be realistic and we remember that and to respect the event. Ballymoney’s Michael Dunlop won the only Superbike race at the North West last year after the event was cut short following the tragic death of rising star Malachi Mitchel-Thomas. The 28-year-old blitzed Josh Brookes’ lap record to raise the bar to 123.207mph and won’t want to relinquish his crown on Saturday, when fans will have the chance to see Dunlop in race action for the first time on his new Bennetts Suzuki GSX-R1000. The 13-time Isle of Man TT winner will be making his first appearance on the roads in 2017 after skipping the Tandragee and Cookstown 100 Irish National meetings. Instead, Dunlop raced in the first British Superbike round at Donington Park and again last week at Oulton Park on the back of pre-season testing in Spain. He will also ride a GSX-R1000 in the Superstock class under the MD Racing banner and has opted for a Yamaha R6 for the Supersport races. Dunlop’s elder brother William is regarded as one of the top contenders for Supersport honours on his IC Racing/Caffrey Yamaha and the 31-year-old has also secured 1000cc machinery, teaming up with the Temple Golf Club to ride a Yamaha YZF-R1. A lack of track time on the 1000cc machines could prove his undoing, but Dunlop will be hoping to be right in contention on his R6.